Variously figured as “knowledge work” or “distributed work,” contemporary professional activities are often characterized by “coordinative, polytextual, crossdisciplinary work that splices together divergent work activities” (Spinuzzi, 2007). Professionals require vertical expertise for their position, but also horizontal expertise that characterized by “learning across boundaries, including organizations, activities, disciplines, fields, trades, and settings” (Ibid). Connectivism suggests that learning is best supported by a robust social network of peers, mentors, and professionals that provide diverse perspectives and promote spontaneous connections in support of the lifelong development of professional capacities and learning. For an extended treatment see Alec Couros’s, “Developing Personal Learning Networks for Open and Social Learning,” 2010. 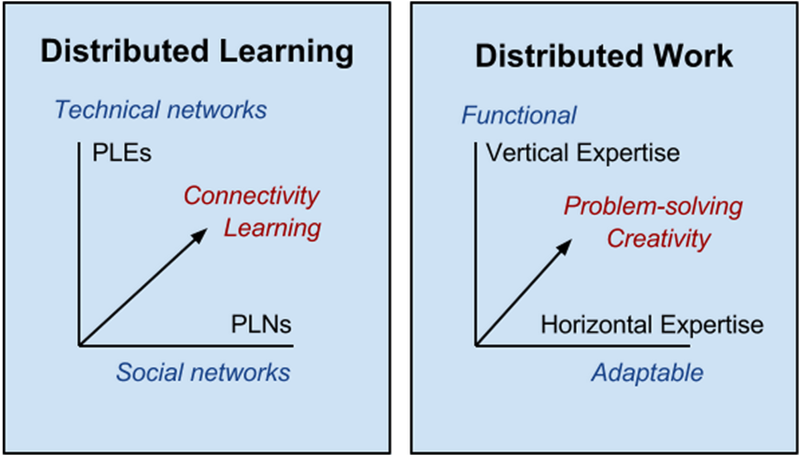 Distributed learning facilitates disruptive innovation and leverages collective intelligence to fulfill the promise: “Chance favors the connected mind.” It means overcoming knowledge silos and fostering meaningful interdisciplinarity; it means the cross-pollination of ideas, connecting markets and solutions, and catalyzing fortuitous opportunities. Technological innovation is no longer just about efficiency and convenience, it is about social innovation and modes of collective intelligence that allow the work we already do to become more productive and available for more uses. Personal learning networks are as unique and diverse as individual learners. The concept suggests a combination of essential tools (technical networks) and networking strategies and resources (social networks). There are a range of philosophies of relevant to the practice of networked learning (connectivism, situated learning, participatory culture, open education, social pedagogies, etc.). Regardless of our inspiration the primary challenge is sustaining and integrating PLN activities into our already busy professional lives. 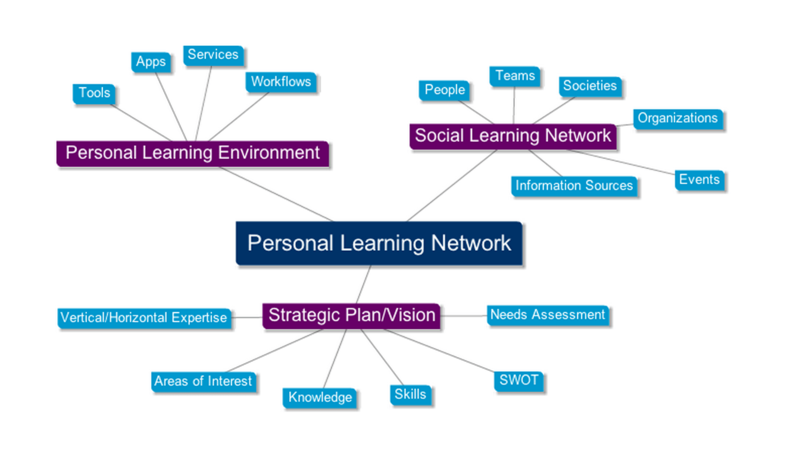 Conceptual Overview: What is a PLN? Each of these activities has supporting examples and explanation. We could do all or some of these. Some could be “in-session” activities; others could be suggested as opportunities for ongoing engagement with the workshop group. (Ex. Participant could be asked to contribute to a running curated list of great people, ideas, resources they encounter during the conference, etc.). Social: Thought-leaders, mavens, laisons, gatekeepers, etc. This is a simple activity. We could create a Google Form and request 2-3 submission from each participant; could also be supported by a social-bookmarking tool like Diigo. Criteria for submission and “tags” could be negotiated and flexible. The activity would result in a public spreadsheet. Social lists would be translated into a subscribable Twitter list (contacts) and RSS feed list (blogs). We could do this as a brainstorming and reflective exercise; it could be recorded on paper, in a google doc, or using a collaborative whiteboard like mural.ly, or with a mind-mapping software like text2mindmap (see example below). In a F2F exercise, we could iterate through the perspectives or ask participants to choose their own approach. Alternatively, we this could be an optional asynchronous activity.